One of the greatest Engineering feats of British rule in India was to lay a railway track through the famous Bolan Pass. More than a century old, this railway track still generates an awe among rail enthusiasts all over the world. Orders for a feasibility survey of Bolan Pass Railway were first issued by the British Government in 1876. Work on the construction of railways through the Pass started in 1880 but was soon stopped after laying of 31 km track due to the occurrence of famous ‘battle of Maiwind’ in the area. 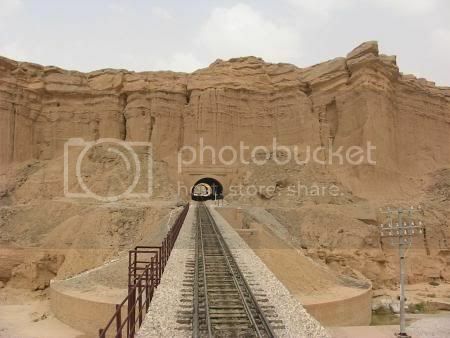 Work restarted in 1885 by rapidly laying a rail track in the bed of river Bolan and finally a steam locomotive rolled into Quetta in August of 1886. The present day railway track through Bolan Pass is the third attempt of laying railways through the pass. In 1889 a torrential flood destroyed the track which was first laid on Bolan River bed. A new track was laid at a higher altitude but that also got washed away. 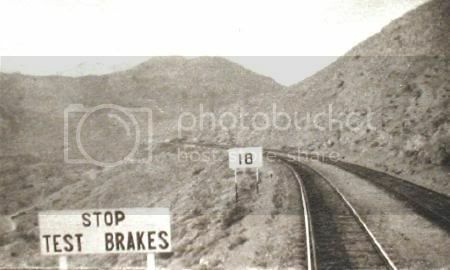 In 1890 orders were issued for laying an all season track throughÃƒâ€šÃ‚Â the Pass. This new track was inaugurated on April 15, 1897 and it is still operational. At some places along the track one can see the abandoned tunnels and the rail bed of earlier two attempts of laying railways here. 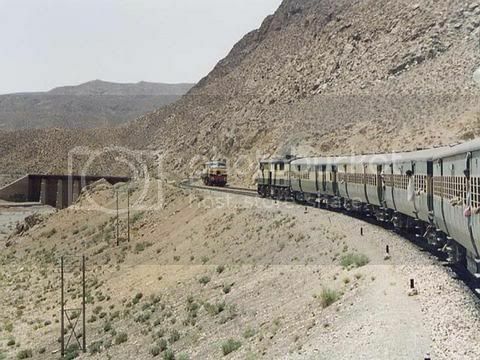 Travelling westward from Sibi, the railway line quickly gains altitude. Following table shows distances and altitude of different stations between Sibi and Quetta. To get a better perspective of Bolan Pass distances I have considered Sibi as 0km. From Ab-i-Gum to Kolpur the gradient of rail track is 1 in 25 which means the track climbs 4 vertical feet in every 100 feet it travels horizontally. For most trains two locomotives in push-pull configuration are used to bring a train from Ab-i-Gum to Kolpur, which is also the highest station (5874ft) on Pakistan Railway network. Many of us may know the local habit of people climbing in and getting out of a moving train. Well, during steam days whenÃƒâ€šÃ‚Â four steam locomotives used to push a train up Bolan Pass, the acceleration generated was so high that railway departmentÃƒâ€šÃ‚Â had to put a notice on various stations warning general publicÃƒâ€šÃ‚Â to refrainÃƒâ€šÃ‚Â from stepping-in and stepping-out of a moving train. One such warning was at display at Mach station until late 1980s. While going up the Bolan pass requires extra locomotive power, coming down the pass requires extra braking power. To get this extra braking power freight trains are sometimes coupled with 5 to 10 empty wagons just to have extra brakes available. 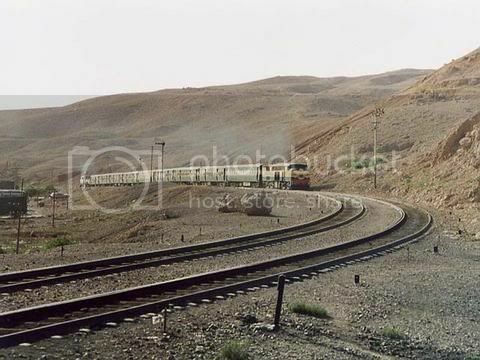 To get another idea of how much effort is needed to bring a train into Quetta, imagine that a single 2400 hp diesel locomotive can pull 70 freight wagons up to Sibi. From Sibi one locomotive pulls only 14 wagons up to Ab-i-Gum and from Ab-i-Gum two locomotives pull these 14 wagons up to Quetta. The locomotives that are used in Bolan Pass are also special and come equipped with Dynamic Braking. Dynamic brakes work on reverse principal. The traction motors that drive the locomotives in up direction become generators in down direction and provide extra drag on the locomotives in addition to the regular brakes. In down direction, all stations on Bolan Pass are provided with a catch siding (track) which ends steeply in a nearby hill. This is done to make sure runaway trains do not enter a station and can be stopped by a raised track in nearby hills. By default the track coming into a station is switched to these catch sidings. When a train approaches a station, it has to stop completely to make sure its brakes are working properly. Only then the track is switched from siding to mainline and a train is allowed to enter a station. 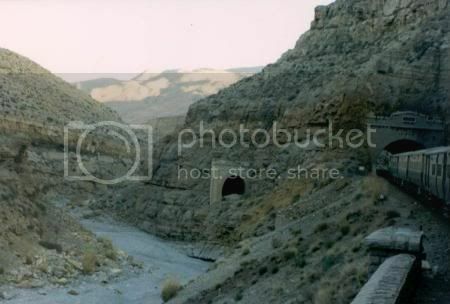 There are 17 tunnels enroute from Sibi to Quetta and the track crosses River Bolan numerous times in a criss-cross journey. The photo to the right shows a section of sequential tunneling through Bolan Pass. For a tourist who wishes to travel through Bolan Pass by rail, a variety of trains and accommodation are available. 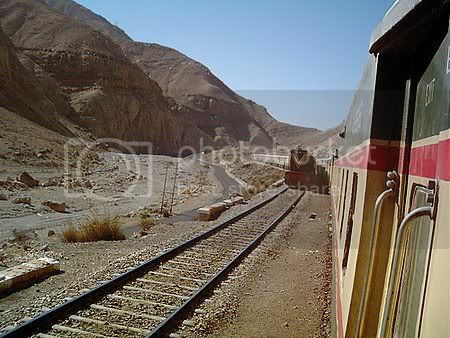 As of summer 2006, there are two daily trains available between Quetta and Karachi (Bolan Mail and Baluchistan Express). One between Quetta and Peshawar via Lahore (Quetta Express), One between Quetta and Rawalpindi via Lahore (Jaffar Express) and one between Quetta and Faisalabad (Chiltan Express). Atleast three of the above five trains have Airconditioned accommodation available on them. I highly recommend a rail journey through Bolan Pass. It is one of a kind rail experience anywhere in the world. 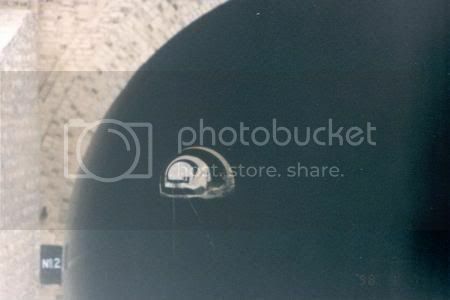 Before I finish this article, note in the photo to the left, an abandoned tunnel is visible at a lower altitude from the one in which the train is entering. This abandoned tunnel is where the second unsuccessful attempt was made to lay a track through Bolan Pass. First unsuccessful attempt was made by laying a track directly through the river bed which is also visible in this photo. 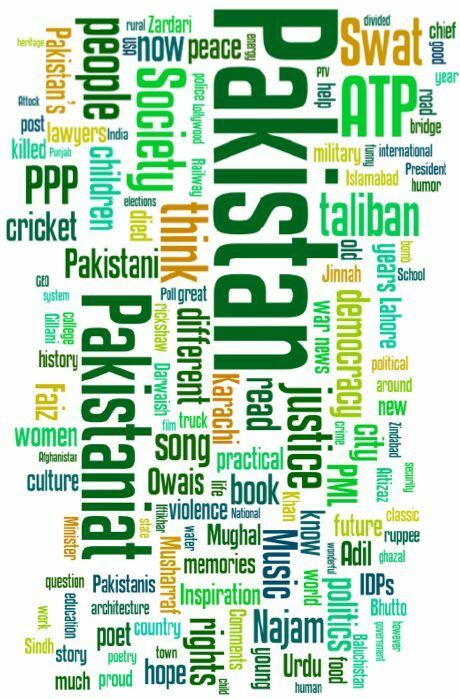 Photo credits for this article belong to Mr. Umar Marwat, Mr. Andrew Jones, Mr. Iqbal Samad Khan and Mr. Malcolm Peakman. It is a master piece of engineering.For those who want to visit please contact Frontier Corps Wing located at Mach.Securuty,food and a decent bed can be ensured. I have an interesting story about the Bolan railway. 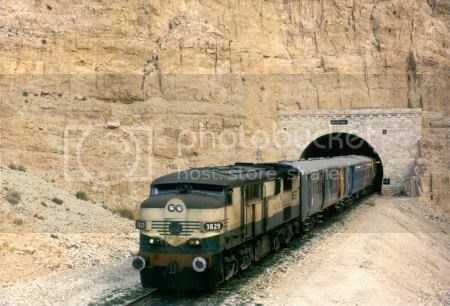 In January 1968 I took a double-decker bus beneath the rail bridge at Dozan with the assistance of the Quetta Tourist Office (Mr Ahmed Nissah Rathore), the railway community and the Quetta Highway department, because the road bridge beneath the railway was too low. During the 6 days it took to clear the path we rode on the Inspector´s trolley to Mach, and each day the trains would hoot and wave at us. There is a sequel to this story, if you would like it . . . ! If you view the Albert Tours page of my website – first tab, at the foot of the page is a photo of the bus beneath the bridge.